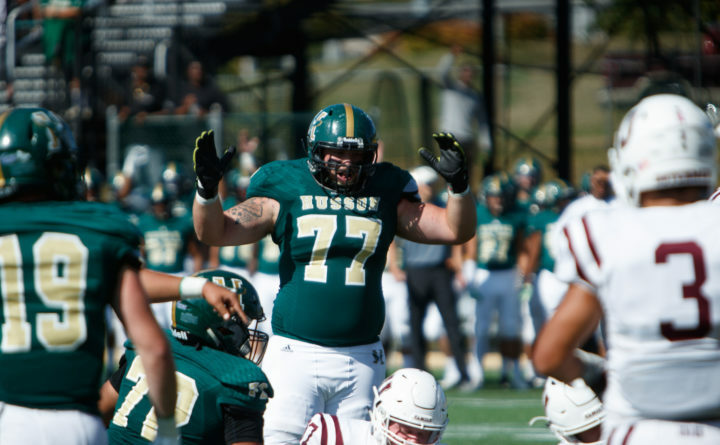 Offensive tackle Jacob Cameron is among the key returnees this season as the Husson Eagles seek to repeat as Eastern Collegiate Football Conference champions and advance further in the NCAA tournament. BANGOR, Maine — As the Husson University football team boarded a bus Friday morning bound for Schenectady, New York, for Saturday’s season opener against Union College, the Eagles took with them an impressive resume. Two straight Eastern Collegiate Football Conference championships and three in the past four years, a 34-9 record during that span with three trips to the NCAA Division III tournament, a first-ever NCAA postseason win over Springfield last November, and a season-ending national ranking all suggest the program is in strong shape among its Northeast peers. But what about this year, which is the team’s final season in the ECFC before joining Commonwealth Coast Football next year, and the potential for a return to NCAA play? While expectations are high — the Eagles are favored to win the ECFC again and return to the NCAAs in a preseason coaches’ poll — the team must adhere to the daily grind that began during the spring football season and continued into preseason workouts. Husson moves forward from a 10-2 campaign minus seven offensive and five defensive starters who have graduated, chief among them record-setting All-American halfback John Smith. Smith rushed for 2,242 yards and 31 touchdowns last fall, and making up those statistical feats will be pivotal to the team approaching its 2017 offensive averages of 37.6 points and 423.5 total yards per game. “There are different ways to get that same result that you’d like,” Price said. The primary constant in the Husson offense is senior quarterback Cory Brandon, a third-year starter and two-time first-team All-ECFC selection. The tri-captain completed 157 of 251 passes for 1,924 yards with 16 TDs and nine interceptions last fall, and is the school record-holder for career passes completed (345), touchdown passes (48) and passing yards (4,678). He’ll be passing to a cadre of receivers that includes senior flanker Kyle Gaudet, slotback Ty Bassett, and split ends Tyler Halls of Lisbon — a sophomore transfer from Western New England — and junior Quintarian Brown of Lewiston. Another promising receiving threat is 6-foot-4, 260-pound sophomore tight end Aidan Hogan, who had eight catches for 72 yards and two TDs last fall while backing up All-ECFC first-teamer D.J. Allen. “There’s not many people in New England at this level of football that’s quite like him,” Price said of Hogan. Husson may employ a running back-by-committee approach at least at the outset of the season with sophomores Miece Loureiro of Westbrook, Freddy Walker and Jordan Marcano, and junior Brian Cedeno all expected to get early carries. They’ll work behind an offensive line led by the left-side combination of sophomore tackle Jake Cameron and senior guard Brad Weston of Gardiner. Cameron was a freshman All-American last fall while Weston earned All-ECFC first-team and All-Region recognition. They’ll be joined by senior center Dom Boulrisse, junior right guard Colin Spence and either junior David Bednarz — one of two 6-7, 270-pound identical twin brothers who both have transferred to Husson from Fitchburg State — or senior Efran Nouel at right tackle. 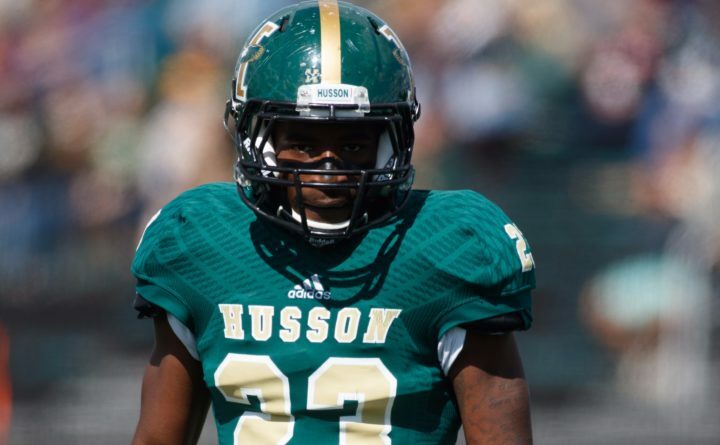 Husson’s defense yielded just 14.2 points and 245 yards per game last fall and returns several playmakers led by senior tri-captains Quan Soyini and Elvin Suazo. Soyini earned AP Little All-American and All-Region accolades at cornerback and All-ECFC first-team status on both defense and as a kick returner after snaring a school-record nine interceptions last fall. A 2018 preseason All-America selection by Lindy’s Sports and College Football America, Soyini averaged 13.6 yards per punt return in 2017. Also returning at cornerback is sophomore De’Wayne Smith, while Jordan Ayer of Bangor will play safety as the 2017 starter at safety, senior Jake Dobos, replaces graduated All-American Jean Gabriel at rover. Suazo, a senior linebacker, led the Eagles with 87 tackles with 5½ sacks and two forced fumbles. Up front, fourth-year starter Tarik Smith and junior Lionel Guillaume return at tackle, and sophomore Frank Curran of Portland, a freshman All-American a year ago, and junior Anthony Bednarz — David’s twin — are at end. Junior Devin Pickett of Sidney returns as an all-conference place-kicker after making 58 of 60 extra-point tries in 2017, while classmate Michael Popolizio is back as the Eagles’ punter. Husson has only four home games this season, beginning with a Sept. 15 matchup against future Commonwealth Coast Football rival Western New England. “We’ve used that [postseason loss] as fuel for the next season and going even further than that, and to be honest, I feel like we can go all the way,” Soyini said.